When artists, crews, and musicians, who, throughout many years created something dubbed “Sub-Culture“ or “Underground“ (although they would never call it that themselves), appear together collectively, it can only prove to be an extraordinary experience. At the BASSart Festival 2013 there were almost 400 BASSartists and over 5,000 visitors. We’re there! DJs, MCs, musicians, performance artists, and street artists – autodidact and professionals. Not a “Sub-culture”, but rather an “Urban Up-culture.” We rouse the overall atmosphere, celebrate the collaboration, and promote the gathering through music, art, and diverse lifestyles. In the tradition of movements which have significantly influenced the last decades, such as skateboarding, graffiti, breakdancing, hip hop, techno, dnb, DJing, VJing and MCing, BASSart is concerned with “skills”. What are we capable of? What do we do best? Over the city limits and beyond. This appraisal is what BASSart should offer, to promote mutual inspiration for a rich variety of results. 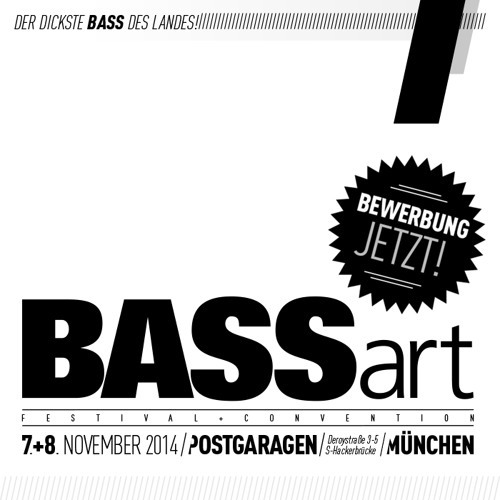 BASSart 2014 - You don’t know what awaits you.